Amid the big mood swings last night as exit polls gave way to real vote tallies, one question began to rise above the din: how to reconcile Scott Walker’s victory with exit polls showing that a majority of voters—52-43 percent, according to the Washington Post—would vote for Barack Obama in November? We can argue about just how much those exit polls can be trusted, given that they suggested a stronger result for Milwaukee Mayor Tom Barrett than he ultimately received. Still, it’s clear that there was a crucial sliver of voters who backed Walker but plan to support Obama in the fall. Who are these people, who could somehow support both a union-busting darling of the Koch Brothers, as well as the capitalism-hating president? Now, the Obama campaign should not take too much comfort in these Walker-Obama voters. They are, after all, swing voters, and Romney and Walker will do their best to swing them in the next few months. But they are the reason why, as I argued yesterday, a Walker win was not necessarily going to as disastrous an augur for Obama as most of the commentariat was prepared to label it. 1. How much did money matter? A ton. Tallies showed Walker and his allies outspending the Democratic side by a 3-1 margin on the airwaves. 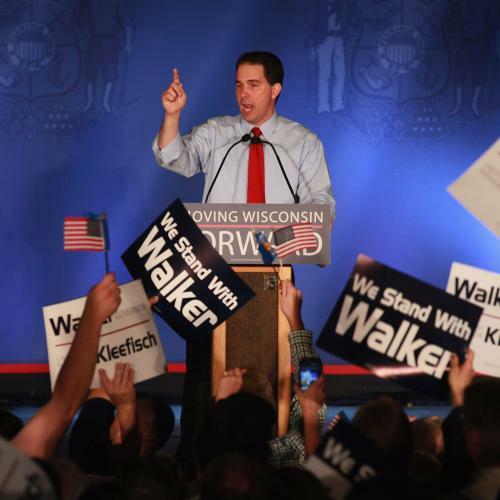 What was the gist of much of the Walker messaging? That the recall was an unnecessary and unnatural step to take -- just what so many crucial swing voters were telling exit pollsters last night. It’s hard not to see that as money well spent. It’ll be interesting to see whether fundraisers for the Obama campaign—particularly for the SuperPAC supporting him, which is badly trailing its GOP counterparts —uses the Wisconsin result as a goad to donors, to say: look, even if we have a strong ground game, as we did in Wisconsin, we need to compete on TV. 2. Why was Wisconsin so different than Ohio? In the Buckeye State, the backlash against Kasich’s anti-union legislation won big—the law was overturned in a referendum last fall by a 23-point margin, and with more votes than Kasich himself received the year prior. I see three main explanations for the difference: first, Kasich’s law did not exempt cops and firemen, as Walker’s did, which made logical sense, given that cops and firemen have among the best benefits of public employees, but which let the union side in Ohio rally around the popular figure of the local cop and firefighter in a way that their Wisconsin counterparts could not. Second, it’s easier to win a referendum than a recall—one is a straight-out rejection, the other involves a choice between the guy in office and the guy who will replace him; along with that comes the matter of timing—the drawn-out recall process gave Walker more time to argue that his law was already paying benefits. (Not to mention that the recalled the awkwardness of an intra-Dem primary this spring. Said one union source who's been active in the Midwest "The referendum was more of a seamless timeline they could keep building towards, whereas the recall became a jump ball 60 days out." *) Third, there is, again, the matter of the money. There was just a whole lot more outside money from conservative groups pouring into Wisconsin than into Ohio. 3. What could unions have done differently? The Wisconsin defeat is a huge blow to public employee unions, and it may well help decide the election later this month of the next president of the American Federation of State, County and Municipal Employees—Danny Donohue, the challenger from New York, will surely use the Wisconsin loss an argument against Lee Saunders, the union’s current number-two and the anointed successor to outgoing president Gerald McEntee. I keep coming back to a question I’ve asked many union leaders the past few years—why did unions not make more of an effort to get out ahead of the anti-union push by engaging in more self-reform, reining in the obvious, glaring excesses (the cops in Yonkers, etc.) that have made public employee unions such an easy target for opportunistic conservatives like Walker? The union leaders rebuff this question by arguing that they simply found it wrong for their members to be scapegoated—bankers’ shenanigans had a far bigger role in the financial crisis and recession than union pensions. Which is true. It’s also true that politicians like Walker, and the groups backing them, were intent on eviscerating organized labor in a way that went beyond mere concessions over pensions and pay, which the unions in Wisconsin made clear they were prepared to make. Still, though, one can’t help but wonder whether the unions could have done more to see this coming and, by self-reforming, draw support from the median voter. At some point in the past year, one could have argued that the unions were benefiting from the assault by Walker et al—after all, when was the last time they saw people rallying to their side as was occurring in Wisconsin, Ohio and elsewhere. But it’s awfully hard to say that today in Wisconsin, where public employee union rolls are plummeting as a result of the new law, just as Walker wanted, and as millions of dollars spent to remove him have gone to naught. Addendum, 1:30 p.m.: A final point worth noting is that the results sure backed up my theory late last week about why Walker's urban crime scare-ad might resonate with voters: because the Milwaukee metro area's demographic/political divide between the city and the suburbs is starker than in many other northern cities, a result of the Great Migration arriving later there than it did elsewhere. Walker romped in the suburbs, winning the three counties to the west and north of Milwaukee with at least 70 percent. *Added these quotes after originally posting the item.